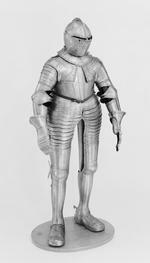 Consisting of close helmet, breastplate, backplate, culet, fauld and knee-length tassets. Decorated with vertical bands of engraved srolling foliage. T. Richardson, 'H. R. Robinson's 'Dutch armour of the seventeenth century'', The Journal of The Arms and Armour Society, vol.XIII, no.4, March 1991, pp.256-278, p.264, ill. fig.10. Said to have been presented to the Shogun of Japan in about 1639 by the Dutch East India Company. This armour was recovered from Japan in 1850's by the Italian Ambassador and was there after heavily restored. It was then in the Villa Aquabella, Florence and later passed to the Brett Collection. Brett's Arms and Armour, 1894, plate 37.